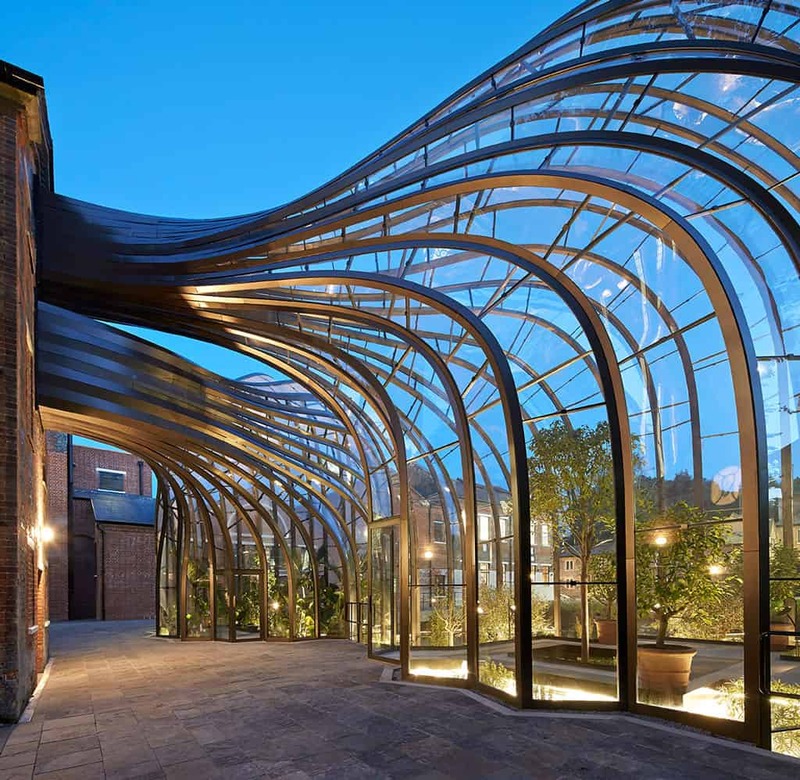 Bombay Sapphire commissioned Heatherwick Studio to design a distillery in England’s Hampshire. The gin maker had acquired a water-powered paper mill that had once been used to produce the bank notes for the then British Empire. The site had over forty derelict buildings that comprised of the main mill building, the owner’s residence and the worker’s cottages. The design team was also faced with the challenge of appreciating the River Test that flows through the site in a narrow concrete channel. The river had over the years been covered as the site mushroomed with buildings and its regeneration was a key component of Heatherwick’s redevelopment scheme. The master plan that was eventually developed addressed the design problem from two fronts. First, the River Test was selected as the datum by which everything would be organised. To make it visible, the river was widened to over twice its original size and its banks were reshaped into green planted foreshores. Secondly, given the deep historical significance of the site, it became apparent that the project would take an adaptive reuse stance. However, to bring order to how the old buildings had been laid out, a courtyard was introduced. Working closely with two government agencies, English Heritage and English Nature, Heatherwick Studio restored 23 of the existing historical buildings whilst getting rid of 9 of the recent industrial buildings. When deciding on the buildings to bring down, the surrounding lush English countryside was taken into consideration so that opportunities for views from the development were rightfully exploited. In order to retain the evolution of the site, whenever a ‘newer’ industrial building that was connected to an older brick one was brought down, its etched mark was left on the retained building. On the onset of the project, the client’s brief had called for the designing of a visitor centre within the facility. However, when the design team were taken through the unique distillation process employed by Bombay Sapphire, it became apparent that an alienated space for visitors would do injustice to the rich experience of gin making. The distillery happens to use a 1761 recipe to infuse the vapours of ten tropical and Mediterranean herbs and spices. It is this train of thought, one that desired to bring the visitor to where the magic really happened, that led to the development of what is deemed to be the highlight of the project – two intertwining botanical glasshouses. These complex forms separately house the tropical and Mediterranean plants that are used in the gin making process. Coincidentally, during the design development of the glasshouses, it was learnt that the distillation process produces excess heat that could be harnessed to create a tropical and Mediterranean ambience for the growth of the herbs and spices. Instead of planting the 10 species in isolation, the studio collaborated with horticulture experts to recreate their natural ecosystems by planting over 100 additional plants. The glasshouses were aptly placed on the widened banks of the River Test, meaning that the plants could directly tap from the flowing source of water. The complex geometries of the glasshouses were achieved by 893 bespoke curved glass components held together by over 1.25 km of bronze-finished stainless steel framing. In the Bombay Sapphire Distillery, Heatherwick Studio offers useful lessons on how to approach the adaptive reuse of buildings. There is a deliberate attempt to bring coherence amidst the chaos of a well developed brownfield site, while staying true to salient sustainable principles. The visitor can now appreciate a widened river as they walk up towards the main production facility. With the restoration of key historical buildings, the imbibing of life to the River Test by allowing it to take centre stage and the creation of the iconic glasshouses – the project successfully juxtaposes Laverstoke’s history with its future. Opening up in the autumn of 2014, the distillery has garnered critical acclaim and clinched an ‘outstanding’ BREEAM rating making it the first distillery and adaptive reuse project to receive such a rating.